It’s a “healing year” for the seventh annual film festival, which will hold a tribute to the Capital Gazette shooting victims. 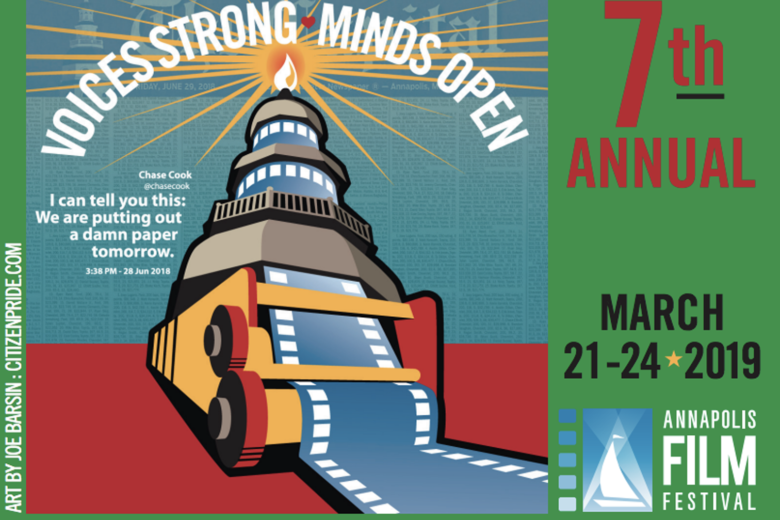 The Annapolis Film Festival returns this Thursday through Sunday, but unlike past years, the seventh annual event comes during a “healing year” after the Capital Gazette massacre. Since its inception, attendance has grown from 2,500 in the first year to 16,000 last year. Visitors will watch 80-plus films screened at the Maryland Hall for Creative Arts, Annapolis Elementary School, Asbury United Methodist Church and Key Auditorium at St. John’s College. It kicks off Thursday with the opening night film “The Public,” directed by Emilio Estevez, who stars with Alec Baldwin, Christian Slater, Taylor Shilling, Jena Malone and Michael K. Williams. Friday brings the documentary “The Biggest Little Farm” by Ocean City native John Chester. You can also check out “Storm the Gates” about local political campaigns across the country. It’s directed by three D.C. women: Josie Swantek, Catherine Yrisarri and Daniele Anastasion. The Friday spotlight is “Villains,” which is off the heels of South By Southwest. Directed by Dan Berk and Robert Olsen, the film stars Kyra Sedgwick, Jeffrey Donovan and Bill Skarsgard. Don’t miss “Little Woods” starring Tessa Thompson and Lily James on Friday and Saturday. Saturday brings the annual “Shorts Challenge” with last year’s champ screening her film funded by Lens Pro to Go, Serious Grip & Electric, Studio Unknown and Henninger Media. Saturday’s African-American Showcase includes “Mr. Soul” about TV pioneer Ellis Haizlip. Saturday’s spotlight film is “Wild Rose” starring Jessie Buckley as a Nashville hopeful. Saturday’s other spotlight film, “Them That Follow,” stars reigning Oscar champ Olivia Colman. If you’re looking for a family-friendly story, check out “Storm Boy” starring Geoffrey Rush. Not to be confused, there’s also a separate feature film called “The Interpreter” on Sunday. If you’re more musically inclined, check out “In Your Hands” starring Kristin Scott Thomas. Sunday also includes “Solace,” starring Lynn Whitfield (“Greenleaf”), who will be in attendance. Whitfield is one of many guests who will participate in various filmmaker panels. Friday brings “What’s Up, Doc?” on the evolution of documentaries; “Social Media: A Filmmaker’s New Best Friend” about online promotion; “Writing for the Screen(s)” about writing techniques; and “The Essentials: Choosing Your Production Team” about finding a crew. Saturday brings “Producers & Directors: In the Ring” featuring tips by producer-director teams, and Sunday brings “Voices of Women in Film” helping female filmmakers navigate an often male-dominated industry. For a more casual chat, head over to “coffee talks” on Friday, Saturday and Sunday mornings. No matter what you’re looking for, there’s a good chance you’ll find it at the festival. Best of all, it all takes place against the picturesque backdrop of a historic town.